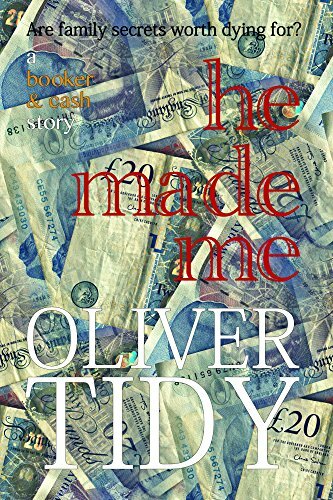 Firstly I am delighted to be opening the Blog Tour for HE MADE ME by OLIVER TIDY along with blogger Sals World of Books and wish to thank Sarah Hardy and Bloodhound Books for the invite. Well having already started my journey on this series by reading Bad Sons I thought that I had a pretty good idea what to expect, but oh boy I didn’t. For one I have been left with the giggles and how I love a crime book that can do that. In the last book I really liked each of the main characters, Booker and Cash, but now it feels like they should be joined at the hip because I just can’t imagine one without the other. Booker’s humour has been turned up a few notches and let me tell you he really walks on a knife edge. He isn’t exactly someone that you could say is politically correct, a bit blunt is more nearer the mark but he always has someone to refer back to, including the Pope! Cash is certainly the thinker of the two and the one with a little more compassion. It is a time for her to find her feet now that she hasn’t got the restrictions of being in the police force. What she is discovering is that Booker does have his sly side, but used with good intensions. This is quite a mystery for the pair to solve, set in beautiful Romney Marsh which with the author’s description makes you want to jump on a train and go there. The pair also have to journey in London, a part that I found most amusing. Hired by a lady that wants utter discretion the pair are thrown into a world of blackmail, lies, works of art and double crossing with a lot of heart break on the way. This really is a belting story to invade your mind. Just go with the flow and thoroughly enjoy it. Such a fun pairing, these two!